The both hailed from Russia, and they were contemporaries. But their biographies could hardly have been more different: Igor Stravinsky and Dmitri Shostakovich. The one was an urbane dandy, and the other an introverted melancholic. 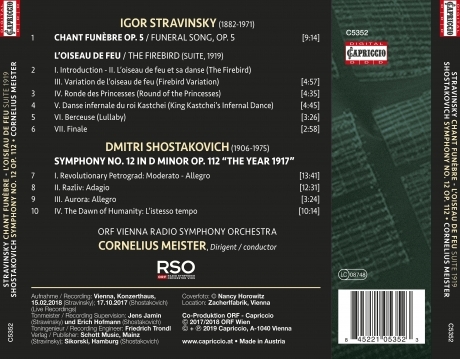 Both were deeply rooted in the music of their homeland, Stravinsky in the wealth of myths and folk customs of past centuries, and Shostakovich directly in the historical events that shook Russia to its very core and frequently gave rise to existential fears. Cornelius Meister, just awarded as "Conductor of the year" by the german classical music award Opus, knows again how to handle these different colours of sounds and shows them in an most transparent way. 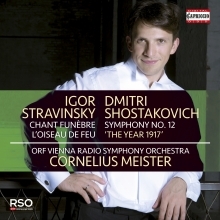 The ORF Vienna Radio Symphony Orchestra has been his best disposed partner for these recordings.